She spent years in the hunter jumper show world and went to England when she was eighteen to train under Carole Broad at Huntley School of Equitation in Glocestershire where she earned a British Horse Society Assistant Instructor’s certificate. She believes there should be something similar to the B.H.S. in America to ensure a certain level of expertise before you teach others. She worked at livery yards and loved to plait (braid) manes the British way. While attending Drew University in New Jersey, Dr. Donna specialized in ground driving (long-reining) at a Welsh pony barn while teaching lessons at Springtree farm in Mendham. While attending Washington State University College of Veterinary Medicine, one of her two jobs was teaching over twenty lessons a week on school horses at a local barn. She loves to teach kids and grown ups with a fear of horses and watch as it gives way to trust. 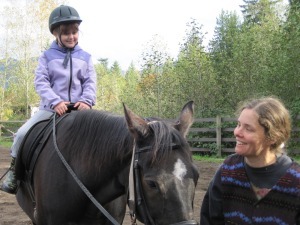 Donna and Charlie (now 21 years old) teaching riding. Years later, when Dr. Donna’s own horse bucked her off many times and pinned his ears when she walked up to him, she knew she needed another way of training. Two wonderful local gifts to the horse world, Kelsy Smith and Chesna Klimek, helped her with Tino in the early stages. She then trained with Robin Gates in the Carolyn Resnick style of liberty training. There she learned an in-depth vocabulary of non-verbal horsemanship as complicated as the riding world, but almost not known at all. This is not like any other “natural” training method marketed today. In this style, instead of a smaller round pen, a giant open field is the setting of choice, the most natural environment to a horse. Later she trained with and learned from multiple people as you can read about throughout this site. Her passion is teaching others liberty training and rescuing young horses.